Both the men’s and women’s cross country teams ended their 2017 seasons on a high note, as the men finished eighth of 55 teams at regionals while the women finished seventh of 32 teams at nationals. The men’s final race of the season was the New England regional championships hosted by the University of Southern Maine on Nov. 11. 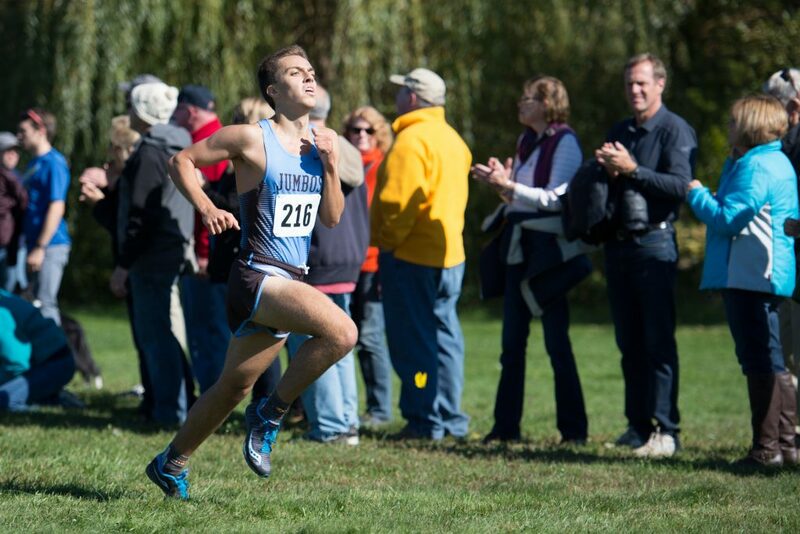 The Jumbos traveled to Gorham, where they competed against nearly 400 runners from 55 schools. Temperatures below 40 degrees combined with 10-mile-per-hour winds made for difficult racing conditions. “The conditions last Saturday were pretty tough. Some gusty winds brought the wind chill into the 20s for most of the race,” junior Colin Raposo said. However, such conditions did not prevent the Jumbos from holding their own among a talented and competitive field of runners. “It didn’t seem to affect anybody running too much,” Raposo said. The eight kilometer course featured a number of difficult hills, which proved to be a challenge for some runners. “The course had a really hard, hilly fourth mile loop which was a make-or-break point for many people,” Raposo said. Being a championship meet, only seven members from each team competed in this race, with the top five runners’ places counting toward the team score. Raposo was the Jumbos’ top finisher, running the eight kilometer race in 26:13 to earn a 35th place finish. Raposo was followed by junior Dylan Jones, who finished in 51st place with a time of 26:22. Juniors Andrew Doherty Munro, Brian Reaney and Christian Swenson finished in scoring position for the Jumbos in the third, fourth and fifth positions, respectively. Tufts’ eighth-place finish prevented them from earning a spot at the NCAA Division III championship the following weekend, as the top two teams from each region qualify. Not being one of the additional sixteen teams selected to go to nationals by a committee, the Jumbos’ season ended with the regional race. Despite their season ending sooner than they hoped, the Jumbos walked away from the race with much to be proud of. The team will have a short break before they begin training for their fast-approaching indoor track season. The women’s New England Regional Championship was also hosted by the University of Southern Maine on Nov. 11. In this field of 393 runners from 56 colleges, the Jumbos finished second only to MIT. Senior co-captain Brittany Bowman stood out with her time of 20:44 to finish third in this large field of talented runners. Bowman was followed by Juniors Natalie Bettez (11th place) and Olivia Barnett (14th place). The Jumbos’ second-place finish qualified them for nationals the following weekend (Nov. 18). Tufts’ top seven runners traveled to Principia College in Elsah, Ill. to compete in the national championship on Nov. 18. A total of 32 teams competed in this race: the top two finishers from each of the eight regional championship meets as wells as 16 teams selected by a committee. The Jumbos proved themselves to be one of the fastest teams in the nation with their seventh place finish. The difficulty of the course and poor conditions did not hinder the Jumbos as they recorded the second-highest national finish in program history. Bowman was the Jumbos’ top finisher for the fourth consecutive week, with a time of 21:04 to earn 11th place overall. Barnett was the second Tufts finisher (21:54) while Bettez was the third (22:02). Sophomore Lydia Heely was the fourth Jumbo to cross the finish line in a time of 22:24. First-year Johanna Ross rounded out the top five with a time of 22:42. Barnett credits the team’s success to their pre-race mentality and collective decision to not hold back. “We all just went for it. That was our strategy going in. It was the last race, we had nothing to lose, so the objective was to just get after it and give it our all. You can’t let yourself get nervous at the fact that it’s the biggest-scale meet you run in all year,” Barnett said. Heading into the weekend, the team set the goal of finishing in the top four. Despite falling just short of this goal, they ran an impressive race to conclude a successful season. The Jumbos finished in the top seven in all of their meets but one this season. In the coming weeks, Barnett says that the team will focus on resting and recovering before the indoor track season.